The Academic Health Center History Project documents and preserves the institutional memory and historical events that chronicle the development of health sciences education and research at the University of Minnesota. The College of Veterinary Medicine collection was recently processed, primarily by finding all the small collections relating to this college and combining them into one place. One set of materials that had not previously been processed, and no one is sure where it came from, is a series of records on a course in the College of Veterinary Medicine in the 1950s called “Clinical Conference Course”. This weekly seminar was used by professors to put a collection of symptoms in front of the students and then discuss what disease might be present. The University Archives now has a collection of the handouts given to students from 1949 through 1962. This set of handouts can be used to get a glimpse into how veterinary medicine was organized and what tests were available during this era. It is interesting to use this type of material for any health science to learn how practice in the field has progressed over the years; this set of records could be beneficial to any student of the history of veterinary medicine. 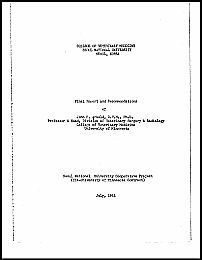 In 1954 the University of Minnesota began a partnership with Seoul National University to provide technical and advisory support for educational programs and administrative organization in a variety of disciplines including medicine, nursing, public health, and veterinary medicine. The project with Seoul National University ran for seven years until 1961. The College of Veterinary Medicine at Seoul National University shares an anniversary date with the U of M’s College of Veterinary Medicine – 1947. 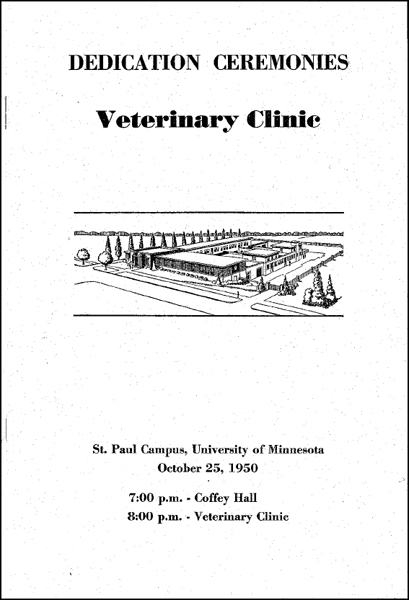 During the period of the University’s work at SNU, John Arnold, professor and head of veterinary surgery and radiology at Minnesota, served as an advisor to the veterinary college and produced a set of recommendations in his final report in 1961. That report is now available in the University Digital Conservancy. The report provides not only a description of the program and its growth, but also a first-hand account of Prof. Arnold’s observations about the changing political structure in Korea and their direct influence on an academic institution. After his work in Korea, Prof. Arnold continued to be active in international veterinary education. He worked as a consultant at the National University in Bogota, Columbia and hosted visiting veterinarian professors from Iran in the early 1970s. Read his final report for the SNU project below. This year marks the fortieth anniversary of the Academic Health Center at the University of Minnesota. The anniversary specifically acknowledges the reorganization of the health sciences units on campus into a new administrative structure that combined the schools and colleges of medicine, nursing, public health, pharmacy, and dentistry under the leadership of the newly created office of the Vice President for Health Sciences. Notice, however, that the College of Veterinary Medicine is not apart of the original grouping? The status of the CVM was a free standing professional graduate program led by a dean who reported to the senior vice president for academic affairs. This organizational structure differs from the recommendations put forward by the External Committee on Governance of the Health Sciences in 1970 that encouraged the Dean of the College of Veterinary Medicine report directly to the Vice President of Health Sciences. When did the College of Veterinary Medicine officially join the Academic Health Center? This year actually marks two anniversaries: First, the 40th anniversary of the Academic Health Center, and second, the 25th anniversary of the full partnership of the College of Veterinary Medicine. Dr. Walter Mackey passed away on Sunday, October 19th. Dr. Mackey was a strong proponent of history and using historical materials to support education and professional development. I first met Dr. Mackey in the spring of 2006 at the Minnesota Veterinary Historical Museum. After discussing the work that I was doing, Dr. Mackey gave me a personalized, detailed tour of the museum’s exhibits and holdings. Through Dr. Mackey I met many faculty members of the College of Veterinary Medicine and attended a board meeting for the museum. Dr. Mackey was a member of the first class of the newly established School of Veterinary Medicine in 1947. His enrollment was a direct result of his own effort to convince the state to provide funds to start the school. In the spring of 1947 he participated in a legislative hearing with a group of veterans that pressed for the funding of a veterinary school in Minnesota. Dr. Mackey had a private practice and also worked at the University of Minnesota as the Director of the Research Animal Division and as an instructor of anatomy for the College of Veterinary Medicine. He helped to organize the MVHM and also served as president of the Minnesota Veterinary Medical Association. For a short time Dr. Mackey also created anatomical models using plastination in order to preserve circulatory and nervous systems for study. Often times our work and personal lives overlap. Such was the case for me this past week as I spent some quality time with my beagle at the Veterinary Medical Center’s Small Animal Hospital Emergency Care. While waiting in the examine room to learn about my dog’s test results, I began to wonder about the history of the VMC and the care it provides. Clinical veterinary work first began at the University in 1888 with the appointment of the University’s first veterinarian, Michael Treacy. For the next 60 years, veterinary medicine was taught and practiced as part of the curriculum of the School of Agriculture. In 1947 the School of Veterinary Medicine was established and later reorganized into the College of Veterinary Medicine. The Veterinary Medical Center grew out of the original veterinary clinics associated with the School of Veterinary Medicine. The clinic on the St Paul campus received state funding to construct new facilities, which opened in 1950. The Veterinary Clinic was to serve as “a hospital for animals just as the University Hospitals on the Minneapolis Campus are devoted to caring for humans. In the hospital, students will be able to observe treatment given by trained University veterinarians to ill animals.” You can read more about the 1950 dedication ceremony in the pamphlet below. The Veterinary Clinic was reorganized as the Veterinary Hospital in 1969. It was renamed the Veterinary Medical Center in 2003 to better reflect the advanced care and outpatient services it provides. The Lewis Hospital for Companion Animals is a component of the VMC and was dedicated in 1983. It was named after the MN State Senator Robert Lewis, an advocate for promoting health and welfare in various communities and who was also a trained DVM. There is a plaque honoring Senator Lewis behind the check-in desk above the floor scale. As for my beagle, he was treated aggressively and released. All signs show him to be in good health. Thank you to all the staff that took great care of him! Several recent archival acquisitions for the AHC History Project are avian in nature. The Raptor Center on the St. Paul campus transferred 28 boxes documenting administrative history, research, and outreach activities dating back to the early 1970s. 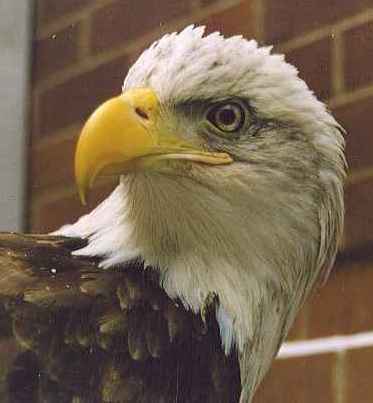 Formally established in 1974, the Raptor Center provides clinical services and release programs to injured birds, public and veterinary education in raptor care and raptor-human relationships, and research and conservation information on raptor populations. A large portion of the archival collection is related to peregrine falcon restoration in the Midwest. The Veterinary Medical Library recently transferred 124 research notebooks which had belong to the late Dr. Benjamin S. Pomeroy. The notebooks document agricultural turkey populations in the Upper Midwest and incidences of avian flu within the flocks. Dr. Pomeroy began studying avian diseases related to poultry farming in the 1930s and remained active in the field throughout his career. The research notebooks compliment existing archival material from Dr. Pomeroy. This material documents his research, academic career, presentations, and professional activities. A third acquisition is the digital preservation of AHC documentation on the study of and proposed emergency responses to a pandemic influenza outbreak of the H5N1 avian influenza virus. The workplan, progress report, and supporting documents are stored in the digital archives. This material was organized and produced by the AHC Office of Emergency Response. With these three collections, the archives is now a great resource for the history of avian health care and disease prevention and the study of the human economic and environmental relationships to bird populations. The Center to Study Human Animal Relationships and Environments (CENSHARE) recently transfer approximately 6 cubic feet of records to the archives. The transfer was prompted by the Center’s relocation to its new facilities at 717 Delaware. The Center, an early promoter of companion animal therapies and studies, is situated within the School of Public Health and has historical ties with the College of Veterinary Medicine. CENSHARE’s director, Dr. R. K. Anderson, and long-time supporter, Ruth Foster, are well known for their design of the Gentle Leader. 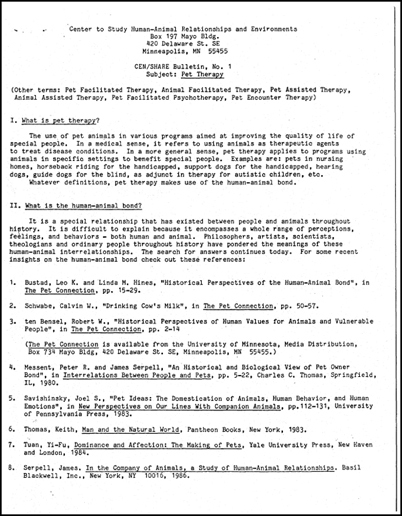 The records include early correspondence on establishing the Center, information bulletins regarding human-animal relationships, conference planning, material related to pet therapies and animal assistance studies and projects, administrative records, newsletters, and photographs. The material documents the Center’s beginnings in the early 1980s through the 1990s. More recent and active records are still maintained by the Center. Today started with a visit to the CENSHARE (Center to Study Human Animal Relationships and Environments) office to discuss their twenty-five plus years worth of records. The center began as a joint venture between the School of Public Health and the College of Veterinary Medicine. It was an early advocate for animal assisted therapy and promoted companion animals as a source of well-being in assisted care facilities. Today it acts as a think tank and granting agency for interdisciplinary studies of human-animal relations. It is a small office run by a director and a loyal group of volunteers. The primary source of income for CENSHARE has been private contributions and proceeds from the Gentle Leader® head collar for dogs developed by Ruth Foster and Dr. Robert K. Anderson, two founding members of the center. The center is moving at the end of the year and wanted to make a plan for their records prior to the move. Last week’s visitors from Seoul National University prompted several conversations with retired faculty either involved with the original partnership or international programs. First, I had the opportunity to meet Dr. Neal Gault, former Dean of the Medical School. Dr. Gault lived in Korea with his family for two years. Dr. Gault and other university faculty acted as program supervisors at SNU during the reconstruction of the medical school and faculty training. I also had the chance to meet Dr. John Arnold, former Head of Surgery and Radiology in the College of Veterinary Medicine. Dr. Arnold was the only CVM faculty member to stay in Korea during the partnership. He and his family were on site from 1960-1961. He described his work as modernizing the training of graduates and supporting the work of the younger faculty. Dr. Arnold also discussed his role as a faculty consultant in Columbia in 1963. Although not a participant in the SNU partnership, I also met with Dr. Stanley Diesch, a retired faculty member of the College of Veterinary Medicine. Dr. Diesch served as director for the CVM’s international programs. In addition to his international work, Dr. Diesch was a founding member and former director of CENSHARE (Center for the Study of Human Animal Relationships and Environments) housed in the School of Public Health. Dr. Diesch also served as the Head of Food Hygiene and Veterinary Public Health. All of the above conversations were enlightening and acted as a starting point for new collection leads. In the 1950s and 1960s the University of Minnesota partnered with Seoul National University in a cooperative relationship to develop educational and research programs in agriculture, the medical sciences, and engineering. The effort allowed University of Minnesota faculty and civil service staff to learn from their counterparts in Korea and assisted in SNU’s reconstruction after the war as an institution and as a source of intellectual labor to strengthen Korea’s post-war economy. Recently, a cooperative partnership between the SNU Archives and the U of M Archives has worked to identify materials held by the two institutions documenting the cooperative arrangement. Currently, researchers from SNU are mining the materials at the U of M to locate unique items not known or held by SNU. This is an opportune time to locate and identify individuals in the AHC that have a connection to the original partnership or departments and offices that may still have material related to the University’s work with SNU. The Medical School, School of Nursing, and Veterinary Medicine were all involved in the cooperative. I have already noted that the small sampling of John Arnold’s papers have some correspondence resulting from the partnership. The School of Nursing has a binder of related documents as well. Dr. Neal Gault, former dean of the Medical School, was also a participant. We are working to identify additional individuals and I hope the current interest in the SNU partnership will generate collection leads and accessions for the AHC archives project.